Caliper demonstrates excellence in quality and innovativeness of evaluation techniques, among other criteria. This award is a testament to our desire to provide – and continually improve – assessment solutions for our clients to help them transform their business and enhance the effectiveness of their human capital. 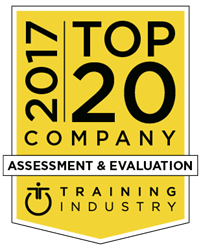 Training Industry has selected Caliper as a 2017 Top Assessment and Evaluation Company. The award is given to companies who fulfill the following criteria: diversity of assessment capabilities; quality and innovativeness of evaluation techniques; company size and growth potential; quality and number of clients and users; and awards, recognition, and competitive differentiation. "We are pleased to announce our inaugural list of training services suppliers in the Top Assessment and Evaluation Companies category," said Ken Taylor, President of Training Industry, Inc. "The companies on this list are a selection of the best providers of assessment and evaluation tools that help guide and direct an organization’s unique training needs, from hiring and onboarding decisions to leadership potential and succession planning." Caliper is pleased to be recognized by the Training Industry, the most trusted source of information on the business of learning, alongside other premier providers of training services and technologies. Training Industry spotlights the latest news, articles, case studies, and best practices within the training industry and publishes annual Top 20 and Watch List reports covering many sectors of interest to the corporate training function. "We are honored to be selected as a Training Industry Top 20 Assessment and Evaluation Company," said Mark Greenberg, President and CEO of Caliper. "This award is a testament to our desire to provide – and continually improve – assessment solutions for our clients to help them transform their business and enhance the effectiveness of their human capital." Caliper’s mission is to create and offer best-in-class assessment tools, as well as people analytics offerings, to help companies, large and small, reduce the risk of bad hiring decisions, build high-performing teams, develop high-potential employees and emerging leaders, and retain and engage employees at all levels. Caliper is a human capital analytics company leveraging decades of data and validated assessments to predict and select high-quality candidates. Caliper partners with all types of organizations, industries, and sectors – from Fortune 500 companies to small businesses and from government agencies to non-profits. Caliper is uniquely positioned to help companies select and develop their next generation of emerging leaders. Whether your business needs to hire for an important position, reduce turnover, improve team effectiveness, or develop current and future leaders, Caliper can help you make the best talent management decisions.